The versatile Scottish dish. Boil 45 mins. Oven 75 mins. 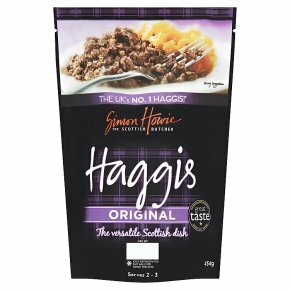 Microwave 5 mins.Original recipe Haggis Simon Howie's Original 454g Haggis is now the world's best-selling haggis! Made with a delicious blend of Lamb, Beef, Onion, Oatmeal, Barley and mixed spices, it is a hugely versatile ingredient which can be enjoyed year round in a variety of dishes. Remove casing and ensure product is piping hot before serving. Remove outer packaging. Leave the skin with clips intact.Wrap haggis in foil. Bring to boil and Gently simmer haggis for 45 minutes. Remove haggis from all packaging, including skin with metal clips. Place in a microwave dish. Cover and place in microwave. Cook on full power (800 watt or category E oven) for 3 minutes. Gently break up haggis then cook for a further 2 minutes. Remove outer packaging. Leave the skin with clips intact. Wrap haggis in foil. Place in an oven proof dish with water. Check water level from time to time during cooking. Cook in a pre-heated oven for 75 minutes (190°C-gas mark 5).